Telluride AIDS Benefit : Annual Art Auction Model Photo. Telluride AIDS Benefit: Annual Art Action Model Photo. Telluride AIDS Benefit Fashion Show Gala, Ramona Bruland. "Mugshots" portrait essay commissioned by Modern in Denver of various Denver designers. 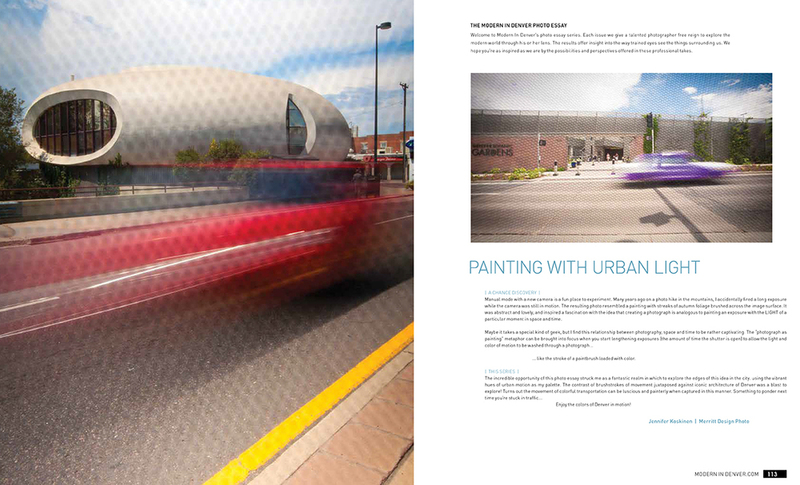 Painting with Urban Light: Photo Essay feature for Modern in Denver. Portrait commissioned by Modern in Denver of Framework developers Jonathan Alpert & Clem Rinehart. Portrait commissioned by Modern in Denver of Brandon Proff, Our Mutual Friend Malt & Brew. Portrait of Architect Harvey Hine of Boulder, Colorado; commissioned by Modern in Denver. Beekeeper & Chef Jesper Jonsson; commissioned by Modern in Denver. Hand painted dress by artist Nicole Finger. Portrait of Sarah Broughton of Rowland + Broughton Architects. Director Barry Sonnenfeld, photographed at his Telluride home; commissioned by Home Theater Magazine. Modern in Denver, American Theatre Magazine, Mountain Living, New York Times, Wall Street Journal, Denver Post, LUXE Interiors & Design, Colorado Homes & Lifestyles, 5280 Home, Denver Life, Telluride Magazine, Aspen Magazine. Also see commissioned Architecture + Interiors: portfolio and on Houzz.